The video shows one bear looking at the phone curiously before picking it up with his mouth and walking away. The man threw his iPhone into a bear enclosure at the Yancheng Wildlife Park. A video going viral online shows the comically tragic moment a man feeding bears accidentally throws his expensive iPhone at them. The incident took place at the Yancheng Wildlife Park in east China's Jiangsu Province. A video of the incident has gone viral on Chinese social media platforms. 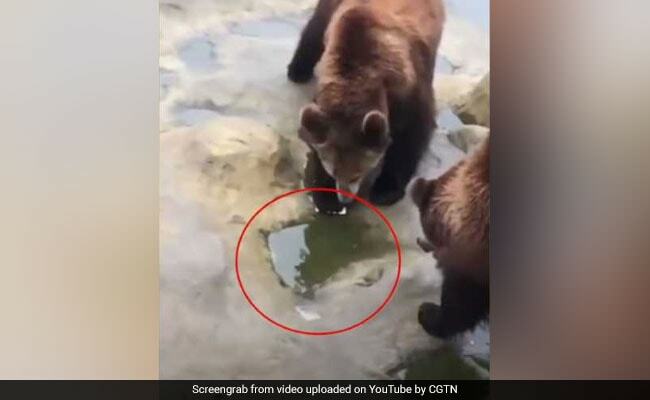 According to CGTN, the man was feeding brown bears apples and carrots while standing on the skywalk over their enclosure. However, in a moment of absentmindedness, he throws his phone at them instead. The zoo staff was able to recover the phone and return it to the tourist, but it was already broken. According to Daily Mail, the zoo released a statement after the incident that reminded visitors not to feed the animals. "The tourist had been trying to feed the bears with apples and carrots when he accidentally threw his phone out," the statement said. Since being shared online, this version of the video alone has collected over 11,000 views, with some commenters jokingly calling it the most expensive way to feed bears. Over the weekend, an 8-year-old girl fell into a panda enclosure in China. She was fortunately pulled to safety, and a video of her rescue is now going viral.